Photo of flying ace and dog found somewhere online by The Nine-Year-Old. One of the side effects of The Nine-Year-Old’s computer classes at school has been that suddenly I have competition for the computer in the office. The Nine-Year-Old is proving extremely adept at using Google to find images* for her Powerpoint bulletins about her nascent private detective agency, the exploits of rogue T. Rexes, and of course, the latest issue of the Daily Imperial. But she’s a bit less adept about closing windows. Generally, when I see something like that, I read it, chuckle, and save it to The Nine-Year-Old’s personal file folder on the computer. And then I close it, thereby guaranteeing that The Nine-Year-Old will never find it again (and therefore, will have to make something new to entertain me the next morning). This combined with the fact that today’s Powerpoint bulletin dealt with an urgent plea from a WWI Flying Ace (Code Name: Snoopy) desperate for help defusing a Glitter Bomb, leads me to believe that The Nine-Year-Old has been researching the Red Baron, aka Manfred von Richthofen, again. But that dog in the picture clearly wasn’t Snoopy. Who could it be? Did the Red Baron have a dog? Yes. According to Deerhound, The Red Baron was extremely found of his hound, Moritz. This photograph of the two of them by the Red Baron’s plane is reputed to be the last photograph of the Red Baron taken during his lifetime. After careful review of this photograph, my cat Canelo and I have decided that the Red Baron must not have understood size words very well. That dog is no lap dog. While we can’t tell Moritz’s breed from these pictures, Moritz clearly stretches from the ground up to the Red Baron’s shoulders. Even if the Red Baron were a relatively short five foot seven inches, that would place Moritz well above the height specification for lap dog status. *Thank you, Uncle Phil, for the tip about putting Google into Safe Search Mode to keep The Nine-Year-Old from finding stuff I’m not ready for her to see yet. In researching this post, I managed to find copies of The Nine-Year-Old’s images at various spots on the web. I’ve listed them below as if they were the actual sources. That said, only The Nine-Year-Old really knows where she found these images, and she’s not commenting on her sources. The only reason she’s allowing me to publish this post at all is because whether or not the Red Baron had a dog is a matter of public record, and doesn’t compromise the World War I Flying Ace’s latest Top Secret Mission (Code Name: Aqua Brass Corgi). Note 1: Plane specifications. This picture was so badly pixelated, I nearly despaired of finding a source for it. However, I was just barely able to make out the words Fokker Dr.1 Triplane in the upper left corner. The words both confirmed that The Nine-Year-Old was researching the Red Baron (he flew a Fokker Dr.1 Triplane), and gave me the keywords I needed for my Google search. 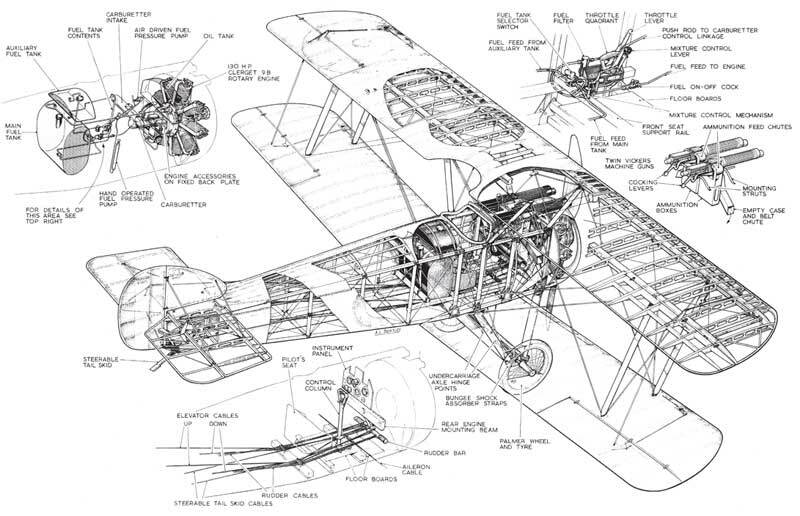 Searching for “Fokker Dr 1 Triplane images” led me to UK-based The Outer Zone, where I found a copy of the specifications and happily, someone to credit for them. Note 2: More plane specifications. The plane in this image is clearly not a triplane, so that rules out the plane flown by the Red Baron. However, The Nine-Year-Old is nothing if not methodical and if she were to download specifications for the Red Baron’s plane, she’d likely download specifications for his arch-rival as well. Snoopy flew a Sopwith Camel, so I searched for that. Sure enough, a Google search for “Sopwith Camel specifications images” led me to this image on the Fiddlers Green paper model plane website. Note 3: The WWI Flying Ace with his dog. I really didn’t have to search very hard for this photograph of the Red Baron and Moritz at all, as Don Holloway’s History Magazine article includes it.